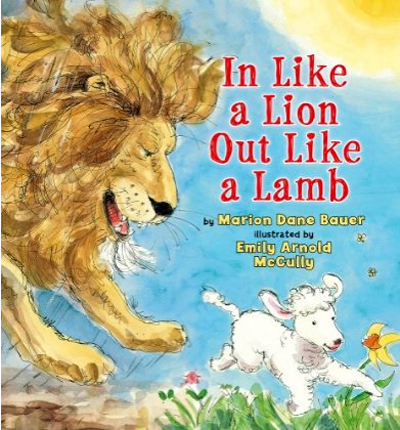 From Kirkus Reviews: "While the text provides the skeleton, McCully's pen, ink and watercolor illustrations truly bring the old song to life. Her lion is a wonderful cross between a fierce foe, threatening with his teeth and claws, and a party pooper, making a mess and spoiling any good times outdoors." From Booklist: "The title's familiar proverb, muse for many a postwinter bulletin board, inspires this picture-book interpretation.both the words and pictures offer a warm depiction of the change of seasons-along with a shout-out to young springtime allergy sufferers."